my take: whilst making our list in december, several chicks had already read the help ... it was suggested that we instead read wench - that it was a more authentic novel. hmmm. most of us read both and our discussion became about comparing the two. i found wench a bit disturbing and not necessarily a book i would recommend the same way i recommend the help. and why is that? 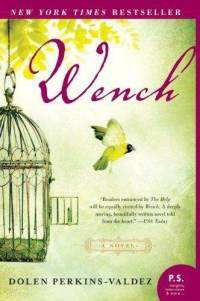 wench is based historically on a summer resort where black slaves were allowed to accompany their white masters. (a short-lived experiment and the eventual site of the first black college.) the help is based historically on one woman's love for her black nanny. even though both deal with the ugliness of race discrimination and oppression, wench is willing to deal with subject in the ugliest of contexts: master to slave. so which is the better "read"? the help ends up being a 'feel good' read; wench is a 'good read' that makes you feel uncomfortable. both have their place. (and both were worthy of discussion.) it helps to know for what you're in the mood.